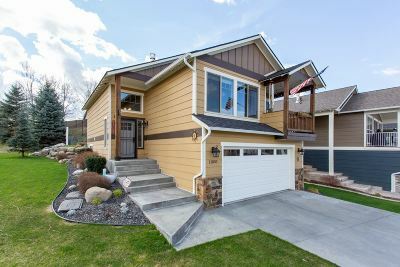 11830 E Rivercrest Dr, Spokane Valley, WA.| MLS# 201914102 | Cooper Realty Services (509) 599-1111 | Spokane WA Real Estate | Contact us to request more information about our Homes for Sale in the Spokane WA area. Don&apos;t miss out on this stunning, fully upgraded original Coyote Rock model home. This home boasts 3 spacious bedrooms, 2.5 bathrooms, a stone gas fireplace and a gorgeous contemporary feeling with peek-a-boo Spokane River views from your covered patio. Stumbling distance from Arbor Crest, just minutes from schools, shopping, and more. This convenient location has it all. General upgrades include high end luxury vinyl planking, brand new stainless steel appliances, rock retaining wall, & fencing.